How did this patient hear about The Willows at Ramapo? Dr. Shapiro is a retired professor of pediatric genetics. On August 9th, 2018, he was admitted to The Willows at Ramapo after being in Good Samaritan Hospital for respiratory arrest related to a mucus plug. Dr. Shapiro came to The Willows with a tracheostomy in place for airway protection. He has had it in place for over two years. In addition to that, he also has a diagnosis of congestive heart failure, hypertension, and past history of having a stroke. He currently lives at home with his wife and with full time help. Dr. Shapiro’s daughter, who is a pulmonologist, is also very involved in his care. Within one hour of his admission to The Willows, Dr. Shapiro was evaluated by the occupational, physical, and pulmonary rehabilitation teams. His main goal for discharge was to be able to do all standing activities with a one person assist. From the pulmonary end, the goal was to stabilize his respiratory status and maintain safe oxygen levels with activity. 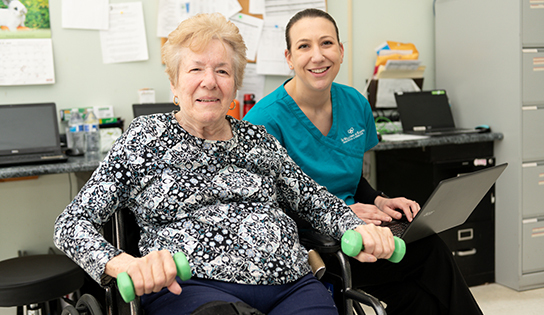 During his occupational and physical therapy sessions, Dr. Shapiro worked on activities and exercises centering around being able to do any day-to-day standing or transferring activities with a one person assist. A focus was to strengthen his legs through sit-to-stand exercises. Through the seated elliptical machine, his ambulation, standing, and seated leg exercises increased. He was able to progress daily and eventually was able to meet his goal and do all standing activities with just one person assist and some activities with even less of an assist. His personal aid was involved in therapy as well. She would carry over the tips and techniques learned in therapy to his day-to-day activities at home. Dr. Shapiro was receiving daily pulmonary care and therapy from our respiratory therapist, to help improve his respiratory status. A full respiratory assessment was done every day to help maintain the integrity of his trach. He was suctioned and given trach care as needed. In therapy, his oxygen, work of breathing, and respiratory status was monitored to help track improvements for his return back to baseline. Breathing techniques and energy conservation tips were given to him to practice at his bedside to help his breathing even more. His daughter was consulted by the respiratory therapist due to her involvement and expertise in the respiratory field to ensure congruity of care. As of his discharge, Dr. Shapiro was able to return back to his prior levels and respiratory baseline. With all the teamwork and cooperation provided by his family, occupational, physical, respiratory therapy, and the entire nursing team, Dr. Shapiro was able to have a successful and pleasant stay here at The Willows. We all wish Dr. Shapiro a safe, happy and healthy discharge home.